Our latest European school partnership has commenced. St Columba’s secured a new and exciting 2 year partnership entitled: Erasmus + ‘There’s No Planet B: Stop Climate Change’. This Erasmus + project links our school with other European schools in Italy, Lithuania and Poland. The project is helping to add an international dimension to our curriculum and develop an international outlook in our pupils, staff and wider school community. Our children have been involved in a number of topics based around the theme of Climate Change. By the completion of this project, our children will have explored the themes of Climate Change, Global Warming, The Greenhouse Effect, Endangered Animals and Polar Ice Caps and Looking at the Future. In the first year of the project teachers have hosted a Transnational Project Meeting and visited our partner school in Poland. They plan to visit the remaining partner schools in Italy and Lithuania next year. After the initial project meeting and training here in Newcastle, teachers from all of the countries discussed inclusion and how partner schools could work in tandem to help improve learning provision for all children involved. It has been fascinating to see how the education systems operate in each country and explore the creative ways they have of delivering a diverse curriculum. Don’t forget to take a look at our project newsletters. You can find these by clicking on the ‘Project Meetings’ link. The Comenius programme is a European Union educational project. St Columba’s has taken part in a number of Comenius projects over recent years and we have been host to a number of Comenius assistants (future teachers who wish to spend time as assistants in schools abroad). Between 2013 -2015 we worked in partnership with schools in Cyprus, Crete, Poland, Ireland and Spain on a project called 20:20 Vision. The key focus of the programme was to develop flexibility, innovation and an entrepreneurial spirit in our pupils to generate a 20:20 vision for employment in 2020 and beyond. We visited each country and worked on the project with our partner schools, teachers and pupils and developed joint ventures with local and national businesses such as Newcastle College and Virgin Money. We had speakers into school to discuss and inspire the pupils about the different types of careers available to them and we looked back at the past profession in our regions that have now died out. Now our project has ended, we hope the pupils will be inspired and hopeful about the new and exciting innovations and careers available to them in the future and will have developed a greater understanding of our partner countries. 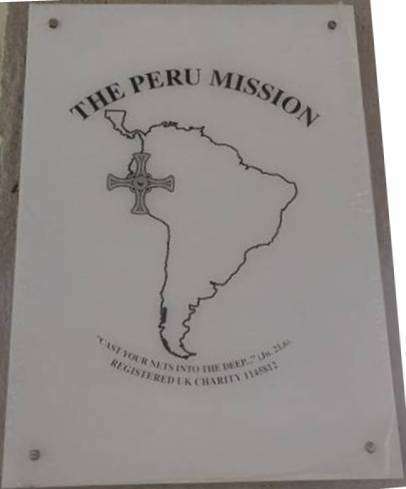 We are linked with The Peru Mission. Joe Plumb, who leads the mission and lives out in Peru, visited our school to tell us all about the work he does there to help the communities in the poorest parts of Iquitos. Joe asked if our school would be able to help to raise much needed funds for the local primary school that we are working with – Fe y Alegria School. Our Mini Vinnies got to work straight away and we organised fundraising events such as ‘pennies for Peru’, a car wash service at lunchtimes and an afternoon tea for the Parish. In total we raised £800 – well done and thank you to you all! £300 was used to buy Christmas presents for the children that live along the river banks and in the barrios. In August 2016, Mrs Jordan visited Iquitos with some members of her church in Washington and took with her the remaining £500. This money was added to other fundraising projects to make a grand total of £7000! With these vital funds, the school was able to build a kitchen and dining area in order to serve meals to the barrio children during their day at school. Mrs Jordan helped with some of the building work and had the privileged opportunity to teach English lessons in Fe y Alegria School. She had a fantastic time and told us all about her exciting travels when she returned to school. Please see the PowerPoint presentation below to learn more! Thank you to everyone in our community who helped to raise much needed funds for such an important project. The barrio children now enjoy a hot meal at school every day. 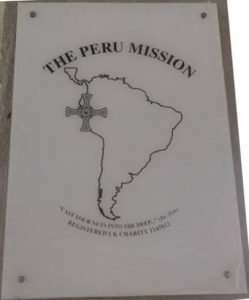 For more information about the work of The Peru Missions, please visit the following website. As part of the British Council ‘Connecting Classrooms’ project, our school is partnered with a school in Ruhengari in the Musanze district in the Northern province of Rwanda. Since the project began in 2008, eight teachers from St. Columba’s have visited our partner school, Rwaza Primary. 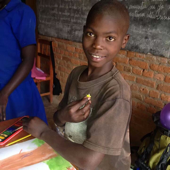 We have worked on many successful collaborative projects with teachers and children aged between 5 and 16 from Rwaza Primary. These shared projects have included topics such as food, culture and landscapes. Through these projects we have developed English language skills and vocabulary. Teachers from Rwaza Primary have visited St. Columba’s and shared their many experiences with our children. We enjoy learning about Rwandan culture and the wider world around us, as well as our global neighbours. 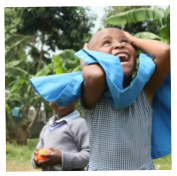 We have held many fundraising events to raise money for resources in Rwaza Primary. Our favourite event was a ‘Dance-a-thon’ which raised a huge amount of money by showing off our best dance moves!